In a heavy cast enamel oval gratin dish, smear the butter all over the bottom and sides. 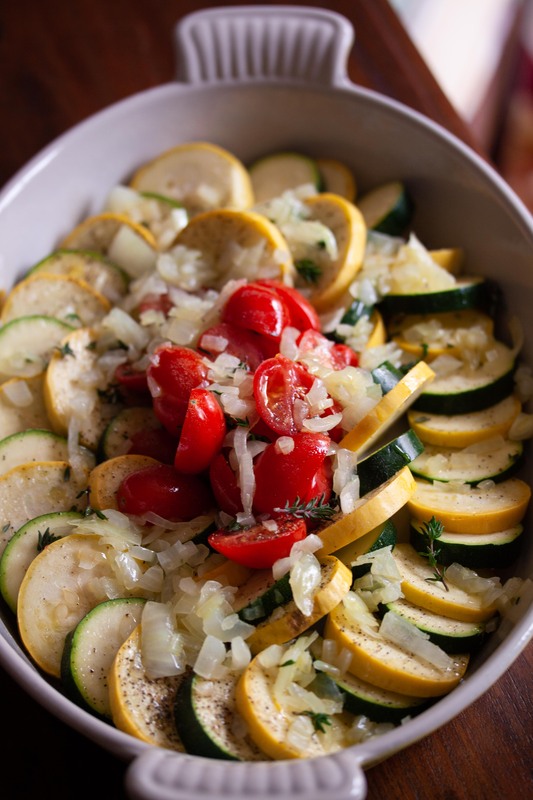 Arrange the slices of zucchini and squash, alternating them. Leave some open space in the middle. Place the cut tomatoes in the middle of the dish. In a small skillet with 1 teaspoon of olive oil, sauté the onion over medium heat until translucent. Add some fresh thyme while cooking and season with salt and pepper. 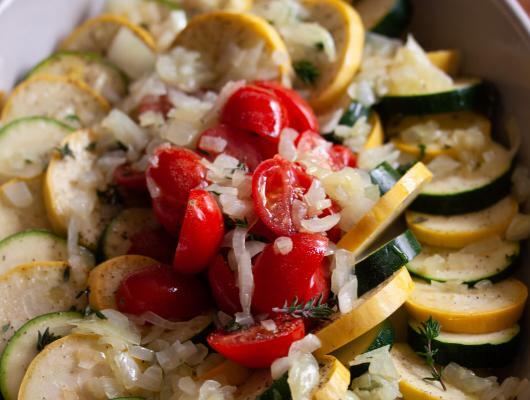 When done, 5 to 8 minutes, gently sprinkle them over the zucchini, squash and tomatoes. Season with salt and pepper, fresh thyme and a generous amount of olive oil. Place in the preheated oven and cook for 15 to 20 minutes. Vegetables are so much a part of our life that we always have a dish, if not two nightly. This is a very simple and yet full of flavor, favorite French dish. This is how I present it or the vegetables that I prefer. However, you can add thinly sliced potatoes, eggplant as well. Great side dish to all meats, fish and poultry.